Bangkok exceeds 1,500 square kilometres in area and is home to more than one-tenth of the country's population. Major tourist attractions include glittering Buddhist temples, palaces, timeless “Venice of the East” canal and river scenes, classical dance extravaganzas, and numerous shopping centres. 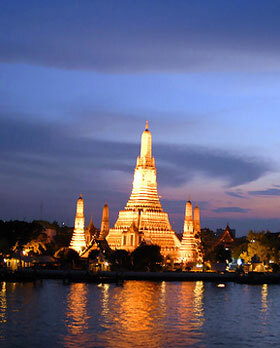 Bangkok is a large city, modern and Westernised and humming with nightlife and fervour. Administratively, it is split up into 50 khet (districts), which are further split into 154 khwaeng (แขวง), but these are more often used in official business and for addresses. Visitors will find the conceptual division below of the main areas more useful for getting around. Sukhumvit – The long Sukhumvit Road, which changes its name to Ploenchit Road and Rama I Road going west, is Bangkok's modern commercial core, full of glitzy malls and hotels. The Skytrain intersection at Siam Square is the closest thing Bangkok has to a centre. Silom – To the south of Sukhumvit, the area around Silom Road and Sathorn Road is Thailand's sober financial center by day, but Bangkok's primary party district by night when quarters like the infamous Patpong come alive. Rattanakosin – Between the river and Sukhumvit lies the densely packed "Old Bangkok", home to Bangkok's best-known wats. Yaowarat (Chinatown) and sights around the Chao Phraya River are also included here. Bangkok's backpacker mecca Khao San Road and the surrounding district of Banglamphu are located on the northern part of Rattanakosin. Thonburi – The quieter west bank of the Chao Phraya River, with many small canals and some offbeat attractions. Phahonyothin – The area around Phahonyothin Road and Viphavadi Rangsit Road is best known for the Chatuchak Weekend Market and Don Muang Airport. Ratchadaphisek – The district north of Sukhumvit centered around Ratchadaphisek Road (part of which is called Asoke) and reaching from Phetchaburi Road to Lat Phrao. This area has really opened up recently as the new metro line follows Ratchadaphisek Road.